Social media and SEO are two things that are very closely related. Both of these marketing strategies are relying on organic search – and find growth by naturally attracting visitors. Like SEO, social media also demands high-quality content and a great strategy for success. While some may deny it, social media actually can improve your SEO when used correctly. Social media have several key points that help your website’s SEO and in this article, we’ll be going in-depth on these 5 Highly Effective Ways To Boost Your SEO With Social Media. Your social media follower amount can help improve your search rankings as a lot of followers are an indication of your brand’s popularity. Previously, there were discussions whether or not social media followers improved SEO and if Google took social media indications into consideration when ranking your website but now those speculations have been put to sleep. 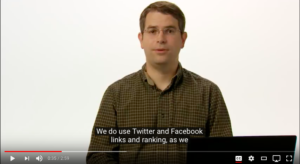 Matt Cutts from Google announced and agreed that Google does take social media indications (followers being one of them) into consideration when ranking your website.Although social media indications aren’t yet one of the key factors in Google ranking, he admitted that social media might have a bigger importance in the future when it comes to ranking. Although social media indications aren’t yet one of the key factors in Google ranking, he admitted that social media might have a bigger importance in the future when it comes to ranking. He also said that it is not only the follower amount that counts. It is the quality of the followers. Therefore, buying 100K fake followers won’t do you any good. Growing your social media followers is a long process but with the right strategies, it can be done at a much quicker pace. When it comes to growing your social media followers, providing value, engaging with your audience and sharing high-quality content are the most important parts. Social media is also a great way when it comes to link sharing – and getting other people to share your content. Apart from Instagram, many platforms are offering the ability to share clickable links in your posts. Just like backlinks, the more diverse external links you have, the more authority your website has – according to Google. There’s a small catch: The principle on social media is just like backlinks on websites. The more links to your website the better. BUT. What really matters is the quality of those links. You have to have to get high-quality links from authoritative social media pages in order to get the best results. In order to obtain these links, you need to share high-quality content, to begin with. Otherwise, there’s no reason to share your content. Your website is the starting point here and the social media platforms work as branches to getting your content shared and ultimately getting links. Start by creating original and unique content that is useful, ask the readers to share your content on their social media platforms There are a ton of more ways you can do this on, for example building your own social media page and then asking your followers to share your content. Doing this will improve your social reputation as a go-to leader – not only in Google’s eyes but in your readers as well. Once you become an authority in your niche, both on your website and on social media, the links and the shares will come. Encouraging your audience to share your content is a simple yet very important point in getting it shared at all. Shares help increase your website’s authority in the same way external backlinks do. Social shares are an indication to Google that your website is something that is being talked about and something being talked about according to Google, is authoritative. Here, you do not only want to try to get social shares but also favorites, likes, comments and reposts/retweets. One of the best ways of getting your content shared on social media is by simply asking for it. If you can offer a reward to those sharing your content, there’s a bigger chance people will actually share it – seeing that they actually earn something from it. Getting people to share your content will not only help your SEO but also gain you more exposure, more followers, and ultimately more shares thanks to the fact that you now can reach more people. It’s like a spiral of social sharing that generates better and better results the more followers you have. This goes for both old and new content. Google also presents social media posts in its search results so by optimizing your social media posts, you can increase the chances of ranking your posts high in search engines as well. Add a descriptive caption to your post that describes the content from your website you’re sharing. In this way, you create a two-way method of ending up on search engines – both with your website content and the content you share on your social media pages. Although this may not be a direct SEO strategy, doing this will help improve your SEO long-term. Increasing your social media presence by sharing high-quality content and engaging with your audience will help you build your brand awareness. An increased brand awareness will lead to more website traffic, and most importantly – more branded searches on Google which will send signals to Google that your website is something people want to see on the results page. It’s just like building a brand. The more famous you get, the more people will search for you and the more Google will reward your website with better ranking because your website becomes more relevant to people. With this one, it’s a bit more difficult to give you exact how-to:s as it is the consistent high-quality sharing and engaging that does the trick over time. One important step, however, is providing value, as this will attract more people to your brand. As we can conclude, social media has the power of improving a website’s SEO but the important thing here is to provide value to your audience and on top of that engaging with your audience so they find you in the first place. Encouraging social shares is also an effective recipe for success. The more social shares you get, the bigger reach you’ll have, the more followers you’ll gain and the higher you’ll rank on search engines.